Swathi Kiran is Professor in the Department of Speech and Hearing Sciences at Boston University and Associate Dean for Research at Sargent College of Health and Rehabilitation Sciences. She is the co-founder and scientific advisor for Constant Therapy, a software platform for rehabilitation tools after brain injury. This interview is available in both audio and written formats. Q: What have been the most exciting advances in aphasia in the last 5 years? Kiran: There have been three major advances that have helped our understanding of aphasia and recovery. 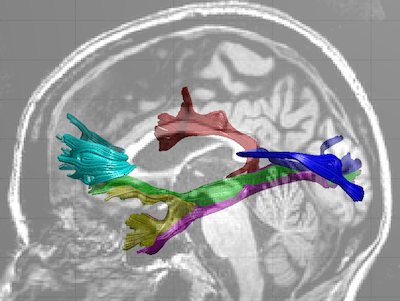 First, advances in neuroimaging technology and techniques have allowed us to learn new details about the healthy brain and the stroke brain. Now that we have the tools to see how aphasia manifests in the damaged brain, we are also able to understand how the brain can recover after a function has been lost. We have techniques in neuroscience that allow us to look at the brain as networks and figure out how recovery may occur. The second advance is in non-invasive brain stimulation like transcranial magnetic stimulation and transcranial direct current stimulation. These recent approaches have allowed us to understand how stimulating the brain can enhance the benefits of providing behavioral intervention. The third advance has been in communication technology – the way we are all connected with our smart phones and iPads has helped us deliver therapy to many more people, especially the ones that cannot come to the clinic due to physical or financial limitations. Q: How do apps like Constant Therapy supplement in-person aphasia therapy and can apps completely substitute in-person therapy for people who don’t have access to such? Kiran: There is a lot of research showing that using in-person therapy once a week is not enough for patients to regain their functional skills. Constant Therapy and other apps provide the opportunity for patients to practice at home, which gives them more chance to recover and improve. I don’t think that apps will completely replace in-person therapy because aphasia affects communication and there will always be a need to enable the ability to communicate one-on-one. But they provide the foundational practice that aid the patients to participate in real life communication. Q: Can caregivers be trained to provide this additional in-person communication? Kiran: Absolutely! I think that caregivers will more and more play a much larger role in aphasia therapy and recovery. A lot of the therapy can now be done at home so caregivers can be active participants and be trained to monitor the home practice, and to communicate and provide a richer social experience for someone who has aphasia. Q: Is there research that shows that people who do additional therapy sessions at home using apps are recovering faster? Kiran: Yes, the initial research that we have done using the Constant Therapy app seems to indicate that. That was not a huge study, we had 51 patients, but the patients who practiced extra therapy at home in addition to in-person visits did show more gains than the patients who were only getting therapy once a week. But this is also an ongoing question in the data that we are examining at Constant Therapy – we are looking at how much at-home therapy patients can practice to continue to make gains. Q: What exciting developments are coming up in aphasia therapy apps? Kiran: There a few developments that will be coming to aphasia therapy in the future. There is already a lot of work being done in England where patients can practice conversations in a simulated virtual environment called EVA Park, developed by Jane Marshall’s group [University of London]. Patients can pretend that they are in a barber’s shop or in a restaurant and do all the things they would normally do except that they are in a virtual environment. This is a great way for patients to practice and build the foundations of their communication skills, which they can then apply to real everyday situations. The other thing that is emerging in therapy apps is that since people are connected via wireless devices, a lot of the apps will be able to collect more precise information about how patients are speaking and how their mouths are moving. This information will help speech and language professionals make more precise therapy outcomes because they will be able to measure the way the patients are speaking and not just what they are saying. The third thing that is going to be exciting is that we will be able to measure the brains of patients as they are doing therapy (either using EEG [Electroencephalography] or fNIRS [Functional Near-Infrared Spectroscopy]). Q: What are some of the drawbacks of current methods of evaluating and treating aphasia? Kiran: The current approach to doing aphasia therapy is actually quite successful. Individuals who are fortunate enough to receive therapy do show improvements in their communication and their social participation. The biggest drawback is that we don’t have a clear set of outcomes that we expect to see when someone has a stroke and is in the process of recovery. It is quite different from other types of disorders for which people can predict where patients will land a year, or two years, or four years after a diagnosis. We don’t have such information for people who have aphasia. Similarly, we don’t have a clear standardized assessment that everybody administers and agrees on so that if someone makes a 10 point gain on an outcome measure, we agree that they have made a huge improvement. Once we have a consistent set of language that we are using for assessments and outcomes it will be very useful for patients, caregivers, doctors, and scientists to interpret observed improvements in people with aphasia. 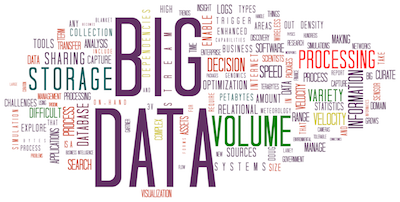 Q: How will big data help improve diagnosis and treatment of aphasia? Kiran: Big data will be very useful for informing aphasia rehabilitation. Aphasia affects people completely differently – no two people have the same profile of aphasia because stroke and aphasia bring such different experiences in their lives. 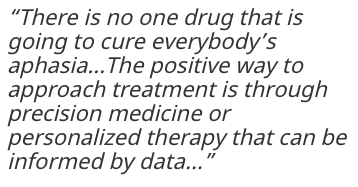 There is no one drug that is going to cure everybody’s aphasia. The good news is that once a person has had a stroke, he is generally going to improve but the improvement is different, and the outcomes are different and individualistic. The positive way to approach treatment is through precision medicine or personalized therapy that can be informed by data collected through therapy apps such as Constant Therapy. And it is not just apps – research labs are collecting a lot more data now from individual patients than they did before. These data will allow us to understand which treatment is the right treatment for the right patient and exactly how much therapy they are going to need to improve. Q: What knowledge about the brain that is still missing will help implement these precision medicine approaches? Kiran: The promise of precision medicine is that since everybody is so different, we can develop individualized trajectories of improvement. But we don’t have all the pieces of information to come up with such robust estimates of recovery. This is in part because we don’t know how the brain can re-learn information after it has been damaged. We don’t know if re-learning is purely an effect of repetition, an effect of the time that the brain is being stimulated, the timing at which the input comes in or the salience of the input. Theories of plasticity tell us that it is perhaps all of these. But to what extent each of these factors of learning impact one person versus another is not clear. Maybe for some people salience of stimuli is more important than how many times these stimuli have been presented during training. This interaction of the factors that influence how people learn is not well understood. The other thing that makes it challenging to develop more effective personalized treatments for aphasia is our incomplete understanding of how the brain may recover after a stroke especially in the chronic phase. There is, however, a lot of research that has been done to understand this process. Neuroimaging is telling us what parts of the brain are able to function after brain damage, non-invasive brain stimulation is telling us that there are certain parts of the brain that you can stimulate that can help with recovery, but how these things actually play out in individual patients, how that relates to the treatment dosage they need, and what kind of treatment they need, is not clear. Q: What is different about bilingual aphasia? How is the recovery of people who speak two languages different from people who speak only one? Kiran: There are several things that are similar about bilingual and monolingual aphasia and that is that both cases affect exactly the same parts of the brain in the left hemisphere. The architecture of the brain is the same whether you speak one language or two languages. The kind of recovery patterns that you would expect when a person has a stroke – a more remarkable recovery for the first nine months and then a little bit more nuanced recovery if you receive intervention is – and the ideas of neuroplasticity and how the brain relearns –are exactly the same whether you are working with a monolingual person who has aphasia or a bilingual individual. What sets bilingual aphasia apart from monolingual aphasia is that a bilingual person uses two different languages, two sets of grammars, two sets of word forms – and they have to switch back and forth between the two languages depending on how well they speak each of them. That makes things slightly more complicated because factors like when and in what language people are expected to speak and how comfortable they are with that language that will affect how much they are struggling with aphasia and how much they improve as a function of treatment. For example, if a Spanish-English patient is being interviewed about his aphasia at the hospital and the doctor only speaks English and the person with aphasia is not that fluent in English his aphasia will appear to be more severe because he is being tested in his weaker language. By the same token, if a person with aphasia is only able to receive therapy in English and that is not a language with which she feels comfortable, the gains and the outcomes that you see may not be as strong as they would have been if she was provided therapy in the language she speaks better. Q: How can caregivers be more helpful to their loved ones with aphasia? Kiran: Caregivers are going to play a much larger role in their family members recovery. They have always played a significant role in enabling recovery but there are ways that they can be empowered now to take greater control of their family member’s recovery because they will have access to a lot more information than they did before. The other thing that I would really want caregivers to know is that aphasia recovery is a constant process. Over the last 10 years, our understanding of neuroplasticity has tremendously improved. Caregivers might hear that their loved ones will only show improvements in the first few months after the stroke and that recovery will plateau after that. This is an absolutely wrong statement. People who have had a stroke recover for many years after their stroke. What needs to happen is continued treatment and rehabilitation, continued experiences to enable and enhance their conversational skills. Continuing to be social is the critical factor that will help them to recover their ability to communicate and their language in general. So that is the most important thing I would want family members to know – that there is no plateau and there is no time to just stop. If caregivers see their family member not showing as much improvement or appearing to be stalling, it is time to try something new. A plateau in improvement just means that the kind of therapy, the kind of stimulation for the brain that the person with aphasia has been getting, has reached an asymptote and now it is time to try a different way to stimulate the brain. Caregivers should always be able to talk to their doctor or their speech language pathologist to find out how they can help their family member to continue to get new types of input and stimulation even a year, two, four, six years after a stroke. Recovering from aphasia is a lifelong journey and caregivers should not think of their family member as someone who is suffering from aphasia but somebody who is living well with it and continues to improve. There are many stories of individuals who still have aphasia but are living successfully with the communication handicap, and are extremely involved in their community and their social life, and those are the examples that we want to emulate and promote.